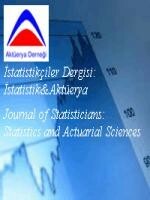 The main purpose of the “Journal of Statisticians: Statistics and Actuarial Sciences” is to publish the articles of research people concerning the topics of Statistics and Actuarial Sciences, whereby the articles that will be sent to the editorship will initially be subjected under anonymous referee control, evaluation and judgment. The principal aim of the Journal is therefore to promote and produce sound contributions in Statistics and Actuarial Sciences. Our Journal is published in Dergipark.gov.tr. It is published at least twice a year. The original articles to be published in the Journal will either reflect contributions to theoretical research or alternatively applied research, which would provide solutions to problems in areas of Statistics or Actuarial Sciences. On the other hand, it is also intended to publish research to generate collective articles on specific topics or subject matters of Statistics and Actuarial Sciences. If the applied research or related empirical examples concern primarily health or security of living beings, according to the ethical responsibility codifications, it is expected that at least one of the authors should be an expert of the investigated area. In case of applications by all the disciplines of engineering, medicine, veterinary science and biology, the responsible researcher should possess an appropriate certificate entitling the expertise. Research work, which would not be directly related to the professional and empirical application areas of statistician and actuarial scientists and furthermore be concentrated rather upon the solutions of very specific problems are usually accepted as remaining beyond the defined coverage of the Journal. However, the final decision for their acceptance is retained within the authority of the Editorial Board.